BEHOLD THE SUN: Would you like to see fiery prominences and new-cycle sunspots with your own eyes? On sale now: Personal Solar Telescopes. ASTEROID IMPACT--UPDATE: Asteroid 2008 TC3 hit Earth this morning, Oct. 7th, and exploded in the atmosphere over northern Sudan. 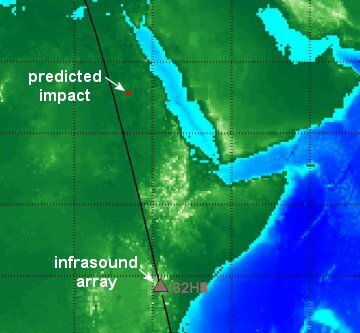 An infrasound array in Kenya recorded the impact. Dr. Peter Brown of the University of Western Ontario has inspected the data and he estimates that the asteroid hit at 0243 UTC with an energy between 1.1 and 2.1 kilotons of TNT. Most of the 3-meter-wide space rock should have been vaporized in the atmosphere with only small pieces reaching the ground as meteorites. "Half an hour before the predicted impact of asteroid 2008 TC3, I informed an official of Air-France-KLM at Amsterdam airport about the possibility that crews of their airliners in the vicinity of impact would have a chance to see a fireball. And it was a success! I have received confirmation that a KLM airliner, roughly 750 nautical miles southwest of the predicted atmospheric impact position, has observed a short flash just before the expected impact time 0246 UTC. Because of the distance it was not a very large phenomenon, but still a confirmation that some bright meteor has been seen in the predicted direction. Projected on an infrared satellite-image of Meteosat-7 of 0300 UTC, I have indicated the position of the plane (+) and the predicted impact area in Sudan (0)." 2008 TC3 was discovered on Oct. 6th by astronomers using the Mt. Lemmon telescope in Arizona as part of the NASA-funded Catalina Sky Survey for near-Earth objects. Asteroids the size of 2008 TC3 hit Earth 5 to 10 times a year, but this is the first time one has been discovered before it hit. 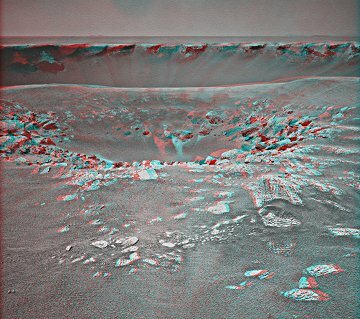 Graphic artist Patrick Vantuyne created the anaglyph by combining right- and left-eye images from Opportunity's stereo camera. The complete panorama, showing the entirety of Victoria crater in the background, is a must-see. Next stop: Endeavor, a 14-mile wide crater some 20 times larger than Victoria. To get there, Opportunity will have to drive seven miles, matching the total distance it has traveled since landing on Mars in early 2004. The journey could take two years. "We may not make it, but scientifically speaking that's the right direction to go," says Steve Squyres of Cornell University. "Endeavour is staggeringly large compared to anything we've seen before." Squyres and colleagues hope that peering into the depths of Endeavour will yield new secrets from Mars' wet and wild past--and, oh, the 3D! On October 7, 2008 , there were 988 potentially hazardous asteroids.